The summit of Mauna Kea benefits from having its very own weather forecast provided twice daily by the Mauna Kea Weather Center, administered by the UH Institute for Astronomy in cooperation with the Department of Meteorology. This forecast, along with a plethora of other information, is compiled on the EAO Weather page. To allow for practical assessment of atmospheric conditions, the PWV in millimetres is converted into five weather “bands” or grades, and it is these grades that dictate the first-level scheduling constraints for a given project. As the opacity increases, more time is required on sky to reach the same sensitivity at a given wavelength. The transmission varies strongly with observation wavelength. The 450 micron atmospheric window requires much drier conditions to be an effective observing band. 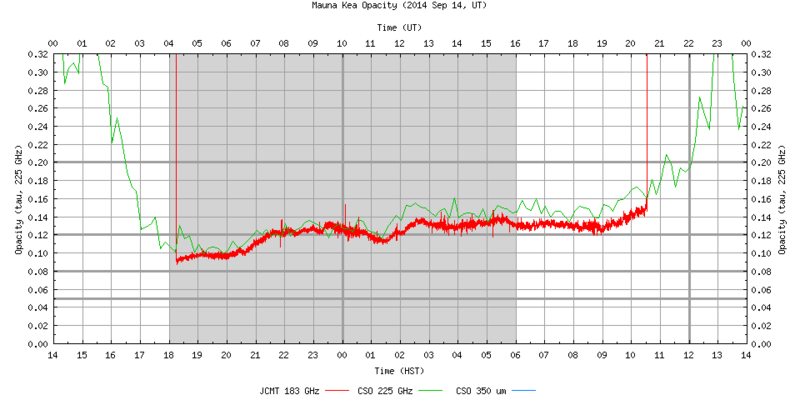 Band 1 conditions are the driest on Mauna Kea, and most typically seen in winter months. Band 1 conditions translate to transmission of better than 82% at 850µm and better than 28% at 450µm. Such conditions are necessary for the shortest wavelength observations, and for deep, high sensitivity observations of faint sources. Band 2 conditions are classified as dry and translate to 850µm transmissions of approximately 77% and 450µm transmissions of approximately 19 %. Whilst bright source 450µm observing is still possible in this band, it is also extremely good for high sensitivity 850µm continuum and spectroscopy. Band 3 conditions are still very useful for a range of astronomy with the JCMT. They translate to 850µm transmissions of around 67 %. However, 450µm transmissions fall to approximately 7%. Bright 850µm targets are often observed in this band, including large-scale continuum and spectroscopic surveys of the galaxy, as well as fainter, high-sensitivity 230 GHz spectroscopic observations. Band 4 conditions translate to 850µm transmissions of approximately 53%, but the atmosphere is virtually opaque at shorter wavelengths (450µm transmissions ~2%). However, extremely good science can still be achieved in these conditions, including bright, galactic CO(3-2) spectroscopic surveys at 345GHz and at longer wavelengths with RxA, our 230GHz receiver. Band 5 conditions are considered to be very wet (by Maunakea standards). They translate to 850µm transmissions of less than 45%, and the atmosphere is virtually opaque at shorter wavelengths (450µm transmissions ~ 0.5%). Again, however, good science can still be achieved, including bright, galactic CO(3-2) spectroscopic surveys at 345GHz and at longer wavelengths with RxA, our 230GHz receiver. This plot collates the typical percentage of time each month that the opacity is measured in a particular band, averaged over nightly measurements taken every night from 2003 to 2014. Summer months on Maunakea tend to be wetter than winter months. 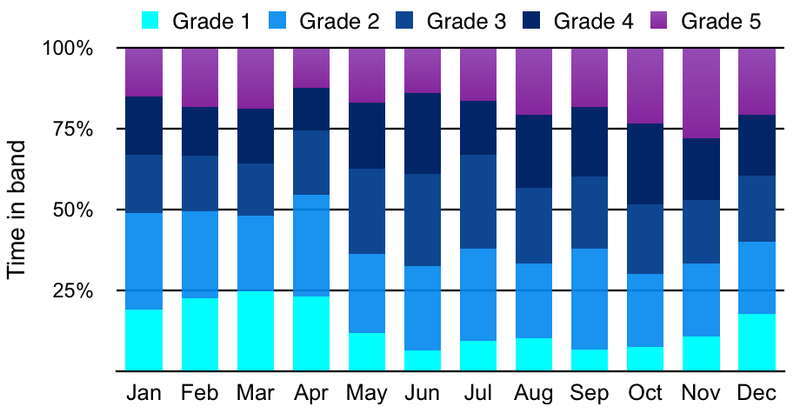 For example, during average winter months (Dec-April) 15 – 25% of the time is Grade 1, while in summertime the fraction can be less than 5%. Good weather is more frequent during El Nino. At least 15% of the time we encounter Grade 5 weather, and as much again is lost entirely to bad weather.